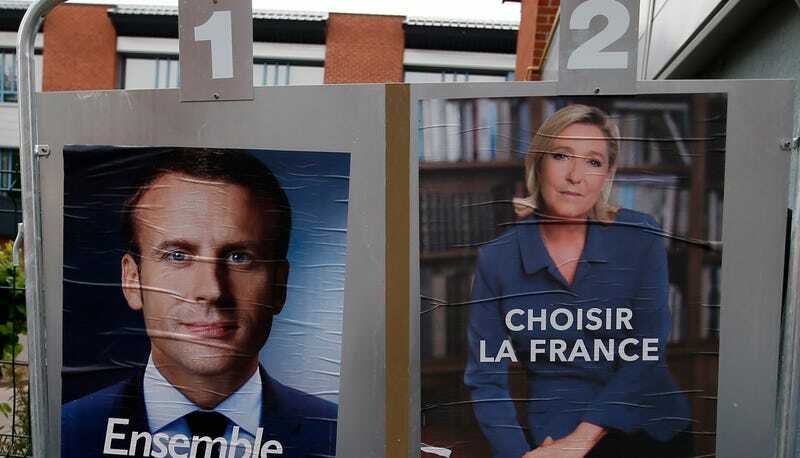 Many who couldn’t help but notice stark similarities between France’s impending presidential election and the recent American one feared the result would be repeated too—that a far-right, Islamophobic nominee with only a small hope of winning would triumph anyway. But that’s not what happened when the people of France participated in their national election today and demonstrated sounder judgment than the majority of voting Americans electoral college points, as they voted independent centrist Emmanuel Macron into the presidency by a decisive margin of victory. According to the New York Times, projections show Macron winning 65% of the vote to Marine Le Pen’s 35%. On April 23, France’s voters chose Macron and Le Pen to face each other in the runoff election that took place on Sunday, forcing leftist candidate Jean-Luc Mélenchon and mainstream right candidate François Fillon to drop out of the race. The choice between the two candidates, depending on where one looked for their coverage, was staged as one between “populism and globalization” or “fascism and neoliberalism,” or “a grave evil and a lesser one.” Voter turnout was the lowest it’s been in 40 years, according to projections. Macron, a 39-year-old former economy minister under François Hollande who has never held elected office, said in a statement on Sunday, “A new page in our long history this evening. I would like it to be one of hope and of confidence rediscovered.” Macron’s campaign platform included promises to strengthen education systems in France’s poorer areas and extend worker protections for self-employed citizens.